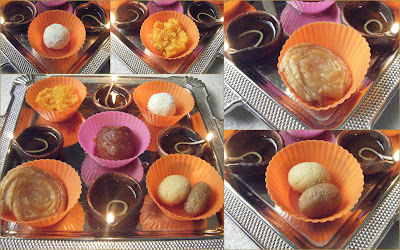 Easycooking: Phenori ~ Diwali Mithai ~ Happy Diwali!! Wishing all of you a very Happy and Prosperous Diwali!! I am late by a day in posting this sweet,life has been busy busy.Cooking and cleaning up has taken a major chunk of my time.This is our first Diwali in Chennai,every time somehow we manage to be in either of our respective homes,but this one we are celebrating in "our" home:).That does sound nice and cozy but the amount of work I am doing alone is not a joke:). In between deafening sounds of 1000' walas and Lakshmi bombs,I made these Phenoris for the first time.I had this sweet some 5-6 years ago when ma-in-law made it.Had a vague idea and I just went with the flow.Followed the recipe from my Konkani Cooking bible-Dakshin Bharat dishes by Jaya.V.Shenoy. Sift together maida and salt. Add butter/ghee and water as required and knead into a stiff dough(like that for puri).Keep aside for 30 minutes. Pinch dough into small balls and roll into thin puris. Take 5-6 puris,smear some ghee on one puri,sprinkle ½ tsp of maida and keep another puri,not fully overlapping on top of it. Continue with the rest of the puris. Roll the puris into a tight roll. Cut the roll crosswise into slices ½ ‘ thick. Place cut surface of slice up and roll into phenori[do not apply pressure while rolling,the layers should be visible even after rolling]. Deep fry the phenoris in ghee/oil on a low flame till golden brown. Prepare sugar syrup by adding same amount of water to sugar and heat till it reaches one string stage. Remove from flame,coat the phenoris in sugar syrup one by one by dipping in the syrup. Take the syrup dipped phenoris out and place on a thali smeared with ghee. Let the syrup set and then store in an airtight container. Share with your loved ones!! Hi Divya...Super Sweet..Perfect shape.looks great.Happy Diwali to u and ur family. Happy Diwali sweetheart! I have a doubt-- Is this Phenori same as Badhusha? If so,I am so gonna try this one!! :) Looks beautiful! phenori looks so delicious..BTw, i tried your wheat pedas yesterday,they were good..
Ria,it is almost like a badusha,probably a thinner and crisper version!! This phenori looks like badusha, tempting mithai Divya..happy diwali wishes to u and ur family dear.. Happy Deepavali Divya!, Enjoying your first diwali as your home?..great...the sound is too much right..hahaha...phenori looks great! Wow.. badusha.. looks so lovely delicious..! Happy Diwali dear.. If you wish send this to my FIL-Ghee Sweets event.! This sounds new to me. Looks so good. Will try it soon, we make a similar sweet named Kaja. YUM! Look like badusha but not! Love the spiral and layers! Happy Diwali Divya! They look good Divya. Happy diwali! I can imagine how sweet these are which i would love. Divya, these recipes took me right back to my childhood. I remember my konkani family making doddak, and I also remember the delicious phenori. Thank you for the memories! Hope you had a lovely Diwali. This looks delicious! I have never heard of the Phenori. It looks delicious - sweet and deep fried? right up my alley! Hi... where did you get the orange cupcake paper in Chennai? Please let me know. Thanks.